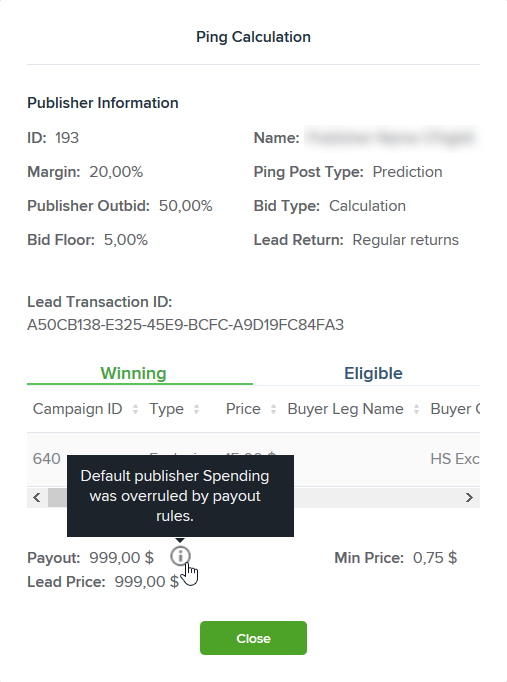 Publisher Payout Management allows building smart bidding rules between PX platform and ping post publishers. You can set different margin or fixed price based on time, ZIP code, weekdays, city, country, county, state, etc. Each payout rule can be applied either on the publisher or sub ID level. Sub ID payout rule has a higher priority than publisher payout rule. Publisher payout rules have a higher priority than Margin or Spending configured in publisher settings. If the lead matches two payout rules, the highest payout amount is applied. For example, there is one rule to bid $6 on state California, and another one - to bid $10 on excellent credit rating. Then if the lead comes to the platform that matches both of these rules, $10 rule will be applied to this lead. Nevertheless, you can change this setting to apply the lowest or average payout. To open payout management for the particular ping post publisher, go to Admin -> Publishers, find the desired publisher and click Action -> Payout rules. Result board visualizes payout rules created in the construction kit. This scheme helps you understand what bids PX platform will send to the ping post publisher for the leads with specific criteria. Construction kit enables the creation of complex and flexible payout rules with various Filter Rules, interacting with the help of And / Or statements. Select only one bidding type per publisher - Margin (%) or Spending ($), otherwise, rules won’t be processed. If you create payout rules for Spending, make sure Fixed Pricing is set to Yes in publisher settings. The list of fields in the dropdown varies according to a vertical selected. Use Search to find the field you need. 6. Enter a value to a field that appeared. It can have different formats according to previous selections. Follow instructions from the previous section. Select only one bidding type per sub ID - Margin (%) or Spending ($), otherwise, these rules won’t be processed. If you create payout rules for Spending, make sure Fixed Pricing is set to Yes in the corresponding sub ID settings. In case publisher’s Margin was overruled by publisher payouts, Price Calculation pop-up in Transactions Ping Post Report includes the icon next to Margin field with a tooltip: Default publisher margin was overruled by payout rules.